Hands up if you decided to get your Samsung Galaxy/Note because it takes awesome photos! They are amazing are they not? However, if you do not back them up there is always that possibility that they may get deleted due to data loss or corruption. Thankfully, deleted photos from Samsung Galaxy/Note are not beyond recovering. There are definitely ways for you to recover them because when a photo is deleted, it is not completely wiped off your Samsung Galaxy/Note it just makes a "mental note" that it has available space waiting to be used and once your old file is overwritten, it is gone forever. Part 2: Where Does The Photos Store On Samsung Galaxy/Note? To recover deleted photos from Samsung Galaxy/Note, you can use a third-party software such as dr.fone - Android Data Recovery. 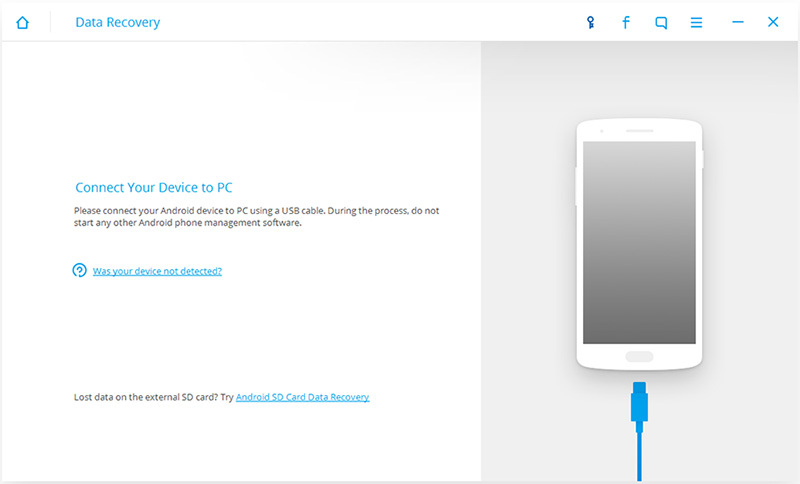 It is the world's first Android data recovery for smartphones and tablets. 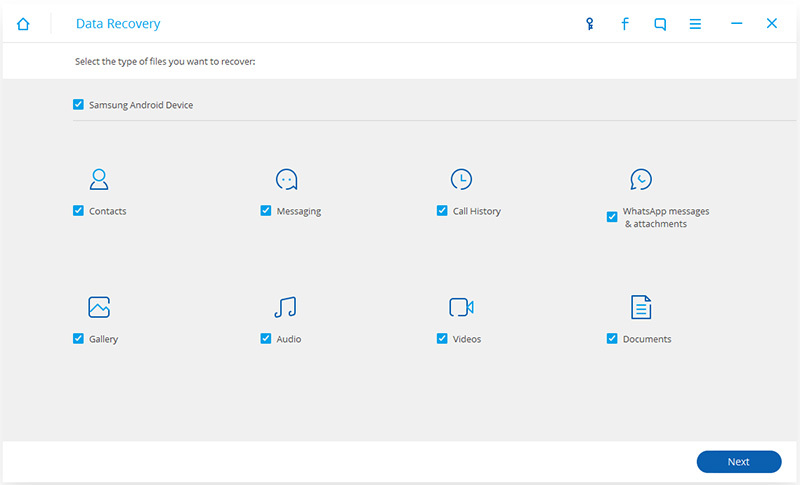 Other than the ability to recover deleted photos, you will be able to also get lost or deleted contacts, SMSes, WhatsApp messages, music, videos, documents and so many more. Launch dr.fone - Android Data Recoveryd and link your Samsung Galaxy/Note with your computer using a USB cable. To recover deleted pictures on your Samsung Galaxy/Note, you should first let dr.fone detect your smartphone. Follow the dr.fone wizard to enable the USB debugging on your device according to the version of Android your Samsung Galaxy/Note is running. 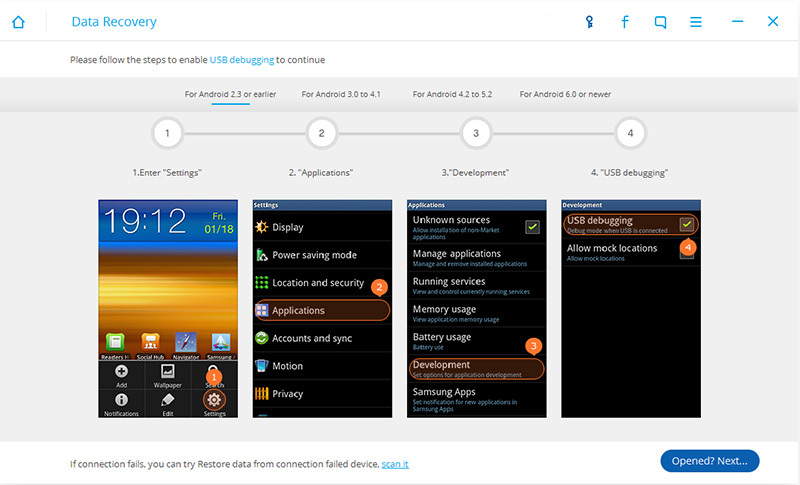 Once you have enabled the USB debugging on your Samsung Galaxy/Note, click "Next" on the dr.fone window to let the program analyse recoverable data on your device. 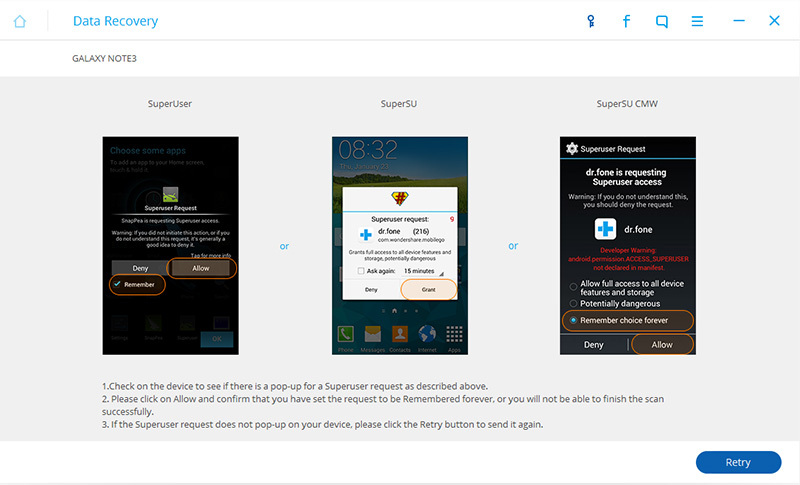 If you have rooted your Android phone before, enable the Superuser authorisation on the screen of your Samsung Galaxy/Note before the scanning process. Click "Allow" when the software prompts you to do so. On your computer, click "Start" to scan your device. To quickly scan for deleted pictures on Samsung Galaxy/Note, check "Gallery" only. 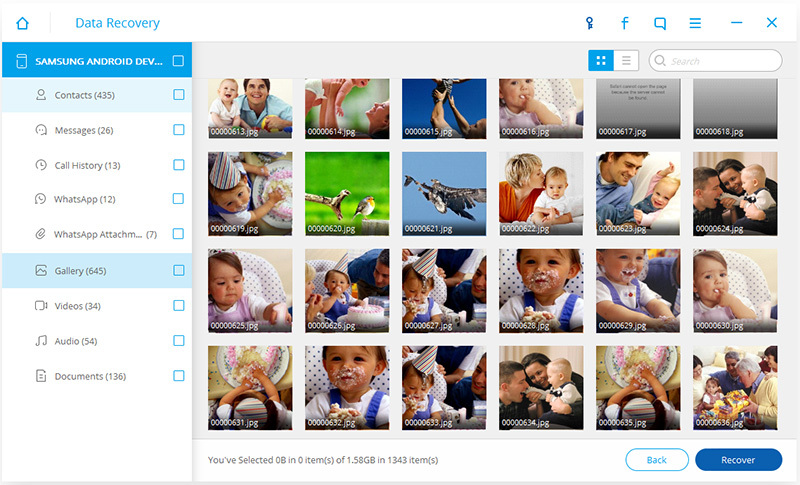 It is the category where all found pictures on your Samsung Galaxy/Note will be saved here. Click "Next" to let the software scan for deleted pictures on it. After selecting file types to scan, select the scanning mode: "Standard Mode" or "Advanced Mode". Choose the right mode for you according to the explanation for each mode. Click "Next" to continue the photo recovery process. The whole scanning process will last a few minutes. While going through the process, if you see the deleted photos you need, click the "Pause" button to stop the process. Check the wanted photos and click "Recover" at the bottom of the program. A pop-up window will appear; select the destination folder on your local drive to save the recovered photos. Samsung Galaxy/Note stores photos in its internal storage, just like as you would when you use your computer. However, internal storage is very limited. Good news is that you will be able to extend storage space on most Samsung Galaxy/Note by inserting an external storage card. When you do so, your Samsung Galaxy/Note will by default save photos in the external storage card automatically. Of course, you can choose to change the storage destination at any time. To do so, all you need to do is launch your camera app, tap the settings icon (gear) and click on more (the ""¦" icon). Capture best moments in your life by using the "Drama Shot" mode. It takes up to 100 frames in a short burst of time. You will be able to choose the best sequence to capture any motion. With this mode, you will never have to miss documenting the best moments in your life. Not every Samsung Galaxy/Note have the "Pro" mode. But if you do and if you like to tweak your photos before publishing on social media, consider using the "Pro" mode. You will have access to manually change the camera's shitter speed, ISO, white balance etc. All you need to do is experiment with the settings to get the shot that you want. You will also get to capture RAW images which is useful if you like to edit with more professional softwares. Would you like to recreate the Ellen DeGeneres wefie moment but you cannot get everyone in? Simply use the "Wide Selfie" mode. It uses the same concept as the "Panorama" mode, only that it utilises the front camera instead of the rear one. Your Samsung Galaxy/Note should be able to simultaneously allow you to use both video and camera functions so that you can capture motion and snap a still frame of the perfect moment. Like the "Pro" mode, not all Samsung Galaxy/Note have the "Eraser Shot" tool. This is exceptionally useful when you are taking scenic pictures that are spoiled by groups of tourists walking in the foreground. Bought a brand new Samsung Galaxy S9 and want to enjoy your music on S9 too? This article introduces 3 easy ways to transfer music from iTunes to Samsung Galaxy S9 and other Android devices. How to Transfer Music from Computer to Samsung S9/S9 Edge? Want to transfer all your music from computer to new Galaxy S9 so you can enjoy music everywhere? This article introduces 3 different ways to transfer music to S9 from computer easily. Samsung Galaxy S9 vs Galaxy S8: Is It Worth the Upgrade? Get to know an in-depth Samsung Galaxy S9 vs Galaxy S8 comparison right here. Know the difference between S9 and S8 and decide if it is worth an upgrade or not. 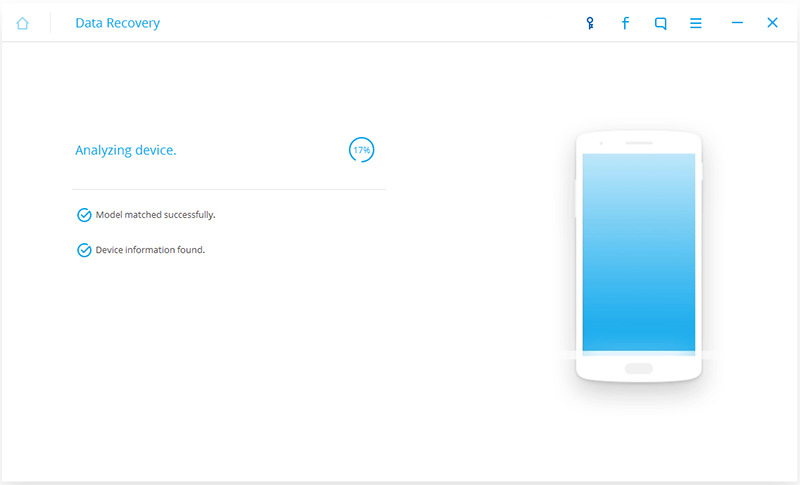 Read on to know everything about Samsung’s Bixby. It is so much more than Samsung version of Siri. We have got it all covered for you in this informative post.